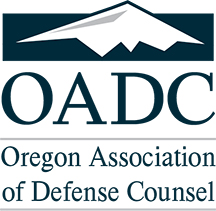 The Oregon Association of Defense Counsel (OADC) is committed to maintaining your confidence and trust, and values your privacy and recognizes the sensitivity of your personal information. OADC respects the privacy of its members and other visitors to our website. Most data that we collect are used to help us better serve our members. It is our general policy to collect and store only personal information that our members and visitors knowingly provide. OADC does not collect any personal information from users browsing its Web site. Only aggregate data (ie: the number of hits per page) are collected. Aggregate data are only used for internal and marketing purposes and do not provide any personally identifying information. While no website can guarantee security, we have implemented appropriate administrative and technical procedures to help protect the personal information you provide to us. Where personal information is required for use of the website (ie: applying for membership, registering for an event, purchasing association materials, advertising, etc.) or in interacting with the website (ie: access to member’s only sections, etc.) it is our policy that your information is private and confidential. The personal information you provide is stored in a secure location, is accessible only by appropriate staff, and is used for the purposes for which you provide the information, such as to reply to your request or to send you requested materials. Please note that on-line membership directories and referral services are a benefit of membership. Use of the directory or referral service is subject to specific rules. The directory or referral information is based on information that members have indicated is publishable and it is available to other members in the members-only section and to the public in referral sections of the website. The information you provide may be collected for: applying for membership, registering for an event, ordering products, purchasing advertising, completing a survey, participating in a referral service, or purchasing or using other services through our website. This information will be used to process your order and if necessary, to contact you regarding the status of your order. You agree and acknowledge that your order may be processed, fulfilled or serviced by third parties other than OADC and you understand that such third parties are not limited by OADC in their use of the information provided to them to process, fulfill or service your order. In order to process, fulfill or service your order, you expressly consent to our sharing your information with any necessary third parties. When members and customers choose to pay for transactions using a credit card, the association submits the information needed to obtain payment to the appropriate clearinghouse. Third party vendors who provide services or functions on our behalf, including credit card processing, web hosting, web software, management companies, etc. have access to the personal information needed to perform their functions. We may share your information in response to subpoenas, court orders, or other legal processes. In order to obtain access to the member only sections of the website, you must be a current member of the association and use your user name and password. You agree that you will be responsible for maintaining the information contained in those areas of the website. You further agree that you will not allow another person or entity to use your account information. You agree that the association may terminate your access to privileges and remove any of your content without notice to you for any reason. The use of this website is solely at your own risk. The association and its information suppliers make no representations or warranties of any kind with respect to the truth, accuracy or completeness of any statements, information, materials, services or data made available on our website. The association and its information suppliers assume no responsibility in connection with the use of information made available on our website. In no event shall the association or its information suppliers be liable for any delays or failures in performance or for any interruption of this website. In no event shall the association or its information suppliers be liable for any special, incidental, indirect, punitive, or consequential damages or for the loss of profit, revenue, or data however they may arise, even if the user or viewer of this website has been advised of the possibility of potential loss or damage. The association does not warrant or make representations or endorsements as to the quality, content, accuracy, or completeness of the information, text, graphics, links, and other items contained on this website or any other website. Such materials have been compiled from a variety of sources, and are subject to change without notice as a result of updates and corrections. Unless otherwise legally permissible, commercial use of the materials on the website is prohibited without the written permission of the association. All trademarks and copyrights mentioned on the website are the property of their respective owners. Some of the links on this and subsequent pages may lead to resources of the association. These links should not be construed as an endorsement by the association and the association is not responsible for their content. You agree that the association will not be responsible to you for any indirect, consequential, special or punitive damages or losses you may incur in connection with visiting this site or any of the data or other materials transmitted through or residing on this site, even if we have been advised of the possibility of such damage or loss. In addition, you agree to defend and indemnify the Oregon Association of Defense Counsel (OADC) and hold the association harmless from and against any and all claims, proceedings damages, injuries, liabilities losses, costs and expenses (including reasonable attorneys fees) relating to any acts or omissions by you or materials or information transmitted by you in connection with our website leading wholly or partially to claims against the association or this site by other callers or third parties. The association shall have no liability for the deletion or failure to store any messages, content or other communications maintained on the website.